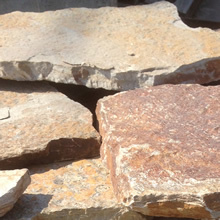 Our Natural Quartzite Flagstone comes in random shapes and we stock a variety of colors and thicknesses for both indoor and outdoor projects. The colors we have available are Gold Rush, River Grey and Sockeye Red. 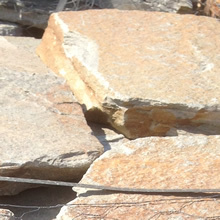 Our 3/4" Flagstone, with a thickness range from 3/4" to 1/4" is usually mortar set over a concrete floor or a structural wood floor. Coverage is approximately - 8# per square foot. 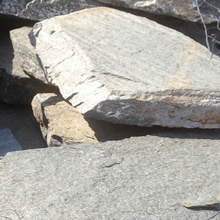 The 1" to 1-1/2" Flagstone offers a more consistent thickness for setting in mortar or in a sand or gravel base. Coverage is approximately - 18# per Square Foot. Our Paving Flagstone ranges from 2" to 3" and is ideal for dry setting in course sand or gravel for exterior paving applications. Coverage is approximately - 23# per Square Foot. They make great Stepping Stones as well!